A wealth of insights about change management. This is an edited transcript of an interview from March 2018 with Fazil Musa of The Levarage Group. Links to the full podcast and video can be found at the bottom. 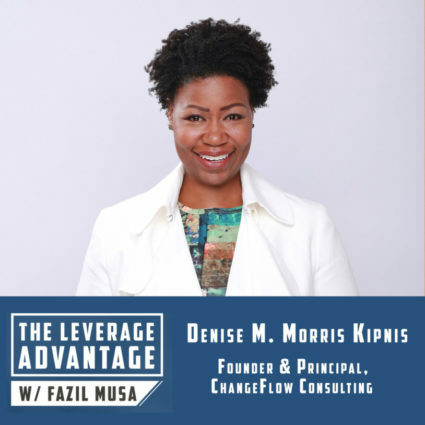 As an organization development expert specialising in transformational change and inclusion, Denise Morris Kipnis has led numerous change projects across various sectors and industries. She studied strategy strategy formulation and implementation, and organization design under Dr. Chris Worley, and takes seriously the charge to build agile and change-ready organizations. She believes in co-creating culture-specific solutions with people in the organization: developing new or existing capabilities by transferring knowledge and skills, leveraging employee leadership and participation, and fostering diversity and inclusion to build trustful working relationships. As well as a Master of Science in Organisation Development from Pepperdine University, a Bachelor of Arts in English from Stanford University and a project management certification from the U.C. Berkeley Extension she has a background in operations and project management. Focusing on practical solutions and business outcomes as well as human factors. Welcome Denise, can you tell me a bit about your story and how you became involved in organisational development? The short version is that I cam in very late and wandered around for a while before figuring out what I wanted to do. Originally, I started in operations which was all about keeping trains running on time, but having spent most of my life being the only person in the room that looks like me and I was very interested in mixed communications and how people work together. Watching people misunderstand each other in ways that they don’t need to, so I’ve always been looking into collaboration spaces, innovation and creativity, that sort of thing. Usually project management is about efficiency and project cost but I wanted to look at how to build teams and how to get the people around you to get to the best solutions. Once I managed to find the big picture, in the middle of the great financial crisis in 2006/7 I started my consulting business and it’s been 11 years, I’ve been in Singapore for about 8 years now and I’m lucky enough to still be passionate about what I do. We’ve spoken previously about inclusion and something you said really stuck with me, so could you share a bit about why inclusion in the workplace is so important and how we can increase it? If you’re intentional about building organizations in a sustainable way, it’s all about inclusion. Inclusion is about creating a system and environment where people can do their best work, where they are able to contribute and have an equal chance to succeed. When you do that, people give you their best effort and their all. If I think you appreciate me and will act on my ideas, it gives me an incentive to be committed and give you everything. The mistake a lot of organisations make right now is that they focus on diversity, numbers and representing different people in the room but they struggle with how you bring them together and use everyone’s skills. If you bring me to a room but aren’t going to listen to me, that’s not inclusion, that’s a waste of everyone’s time and that’s happening a lot right now. So, in terms of doing that, I’m not going to lie, it’s a very slow, thoughtful process because people aren’t used to thinking about whether they can listen to people they normally wouldn’t or accepting ideas that aren’t perfectly formed or perfectly packaged. So part of it has to do with small teams being more inclusive or leaders being more inclusive, being curious of other people and hearing things in different ways. I’ll share with you a little of my own experience when it comes to inclusion, my friends and I were having this discussion about this company that I’m affiliated with. This organization is facing this disparity between remuneration and the work that’s being done. Completely different divisions who are doing the exact same work are getting paid differently, almost by 10 times. It’s creating a lot of distrust and resentment, with the ones being paid less questioning whether or not their feelings are petty and it’s not conducive for any organization. How else can we promote and embrace inclusion in the workplace, or what are some of the basic principles that we need to be aware of when we build an organization? Basically, become more agile and look at how things change and the way you do that. Things change and you need to figure out how to react to that because a lot of mistakes that companies make are because they are constantly following the same processes. You could go to “your guy (or girl)” for brainstorming, but they may not know exactly what’s going on related to the issue, they don’t deal with the part that’s needed. So, you need to get out of the mindset that you go to the same people and instead go to the people who actually know what’s going on in the organization. So, organizational development says that as much as possible, get the whole system in the room when you’re trying to design your change. Because, the more data you have, the more you can see what’s going on around you accurately. It’ll make you better off trying to figure out how to fix it, react or be proactive. What I am saying is that I don’t see them separately: if I am getting involved in inclusion, I am generally going to be involved in some sort of organisational change. And any organisational change will benefit from paying attention to inclusion. For a lot of entrepreneurs and small businesses, making the first hire can be hard because there is a huge mindset shift there and requires a lot of trust. So, how does one decide what their first hire should be? So, to give a bit of context, I started the business 11 years ago and it was with a non-profit with one employee and a team of volunteers. I’ve been blessed to be able to work my way to multinationals but I still have a soft spot for smaller organisations. If something is going to change within them, it’s pretty much able to be done on the same day but if you’re trying to change a multinational there are a bunch of people to talk to, it takes time and it’s a lot of politics and red tape. I always say one of the most controversial things which is; don’t pay much attention to the job description, pay attention to the mindset. You want to think about the kind of person who is going to grow with you and whether or not they can adapt and change with you. Hire someone who likes to learn and grow and who is going to be flexible enough to figure it out. And, what excites you most about your industry? I used to be a project manager and that means I can literally build you a process and break it down into little pieces which is one of my superpowers. But the thing that always draws things apart are the people, they get involved and things go sideways. But, that’s also fantastic because you never know what might happen, what might emerge and it creates variety. I like that flexibility and change in perspective, so for me it’s definitely the complexity and chaos. I love that! Tell me what you’re doing to unwind now you’re in Singapore? When I was in the states it was my commute and those 30-40 minutes in the car with my music on was familiar and how I unwound. Now, I am a pedestrian and I’m always finding new places and seeing something new or interesting. As much as I love working with people, I have limited capacity for that, I’m an introvert and like to spend time alone. So, reading, music and really bad movies. And lastly, if people want to find more of you, where can they go? Thank you so much to Denise Morris Kipnis for giving us inside information on organisational development and inclusion. I think the key takeaways from Denise are that the two are intertwined and whether you’re a small business or you’re growing, you’ll find that you can’t deal with inclusion without making some sort of organisational change. I also think it’s interesting to note what inclusion actually means; it’s not getting people in a room together to say that you’re inclusive, it’s listening to everyone equally and sharing ideas and being open to more of a discussion. Thanks again Denise.